This tablet stand will make your whole life so much easier. Add a little spice to whatever room you use it in by personalizing it to fit your decor! 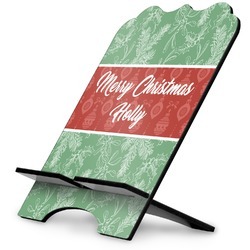 This hardboard tablet stand is perfect for so many occasions. It is approximately 9.6" x 12" and fits an iPad Pro with just enough of the stand showing to see your personalized design. The top of the stand has a decorative curved edge for some extra class. The stand is made of two pieces that fit together easily and balance against one another. The bottom part of the stand even has a space for your tablet's charger to fit while you are using it! 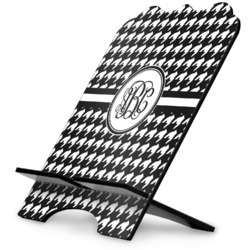 Personalize your tablet stand with a crazy pattern or fun graphic! Look through our system full of design elements to put together to create the perfect design! Both the front and bottom of the stand are sublimated to make a spectacular design. If you ever have any questions, get in touch with us on our online chat or by phone. If this product interests you, be sure to check out the rest of the electronics section! We also have smart phone stands.